I was recently introduced to Salon nail brand Precision during a press event and although not a brand I’d encountered before, my eye was immediately drawn to their new collection entitled Glam Rock. The overall look of the products is sleek with their OPI-esque packaging, heavyweight bottles and even contoured handles! The Glam Rock collection comprises of 6 darker, slighty industrial shades which all fit in well with the concept. I’m really late in swatching these… I’ve been looking at them longingly for about a month, but having been without camera means that I’ve got a hell of a lot of catching up to do now! 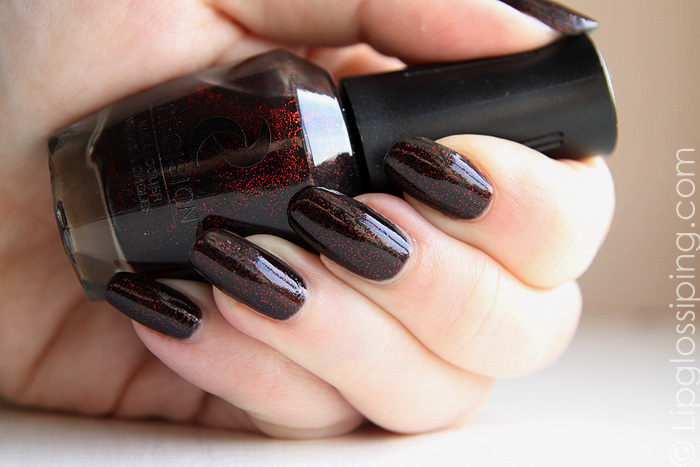 The red glitter suspended in a black base is not an original concept. I’m thinking China Glaze Lubu Heels, Eyeko Vampira, Color Club Red Velvet etc.. etc… but it’s a good idea well executed here by Precision. I have no complaints about quality, infact the bottle and brush are simply divine. It did require three thin coats to achieve the above finish… but if you’re a little more heavy handed than me, you would be done in two. What I will say for this collection is that so far I’ve worn two from the six shades I was given and one of them has just easily jumped into my top 20 Winter polishes of all time. It’s THAT gorgeous. I’ll get it posted up later in the week. Precision is available to buy online from their website or Venus Nail & Beauty with bottles priced at around £5.99 each. Rebel Red reminds me of Eyeko’s Vampira! ooh reminds me of caviar! Looks great. I got my Barry M Giveaway prize in the mail today! Woo hoo! I’m excited! Really gorgeous colour! I was thinking it looks like Vampira as well! Would love to see what the navy one looks like! I had never heard of this brand before but this shade is gorgeous! It reminds me of Eyeko Vampira too. I don’t care that it’s not v original I LOVE it! good god. when you thought the bottle of opi was too bulky and the the bottle of china glaze is too unsightful for words, there comes even uglier bottle of precision. Was it man designing this? Give it some curves at least!